Except they might be a little more rushed this time, because... /doingstuff orz""
Oh, wow, I love your style! I can't even explain it, it's just awesome. I hate making requests, but I would like a more realistic avi. 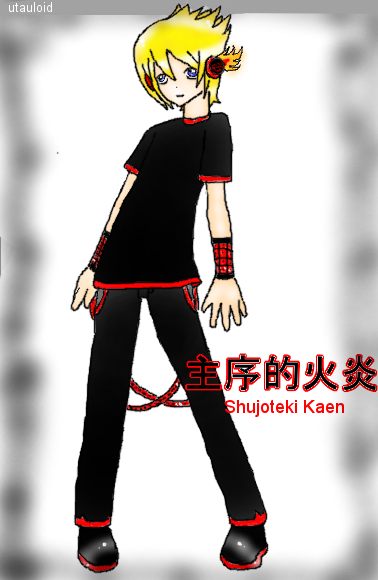 Songs that describe Kaen: BLAZE, Psychotic Love Song, and Rotten Boy, Grotesque Romance (although Kaen isn't a stalker). He's a pyromaniac with anger isues (although he tends just to seethe rather than to lash out, though when he does, it's scary.) Once he finds love, though, he's very loyal. I'll stop ranting about his personality, though. I have to stop myself before I write a book. BlazePyron wrote: I'll stop ranting about his personality, though. I have to stop myself before I write a book. can you save me a spot please i have been waiting to find out who did that Mathieu art. i only ask because I'm hosting a contest for kurisu's redesign. and it ends next week. zinfandel wrote: can you save me a spot please i have been waiting to find out who did that Mathieu art. i only ask because I'm hosting a contest for kurisu's redesign. and it ends next week. She's a big tsuntsun,so One Sided Samba would describe her quite perfectly! Ahh,also,her eyes are a rather dull blue-gray. I wish I could open more slots at one time, but I'm one slowmofo. orz""
The picture was drawn on OpenCanvas,and the trail for it ended,so I never did get to finish. 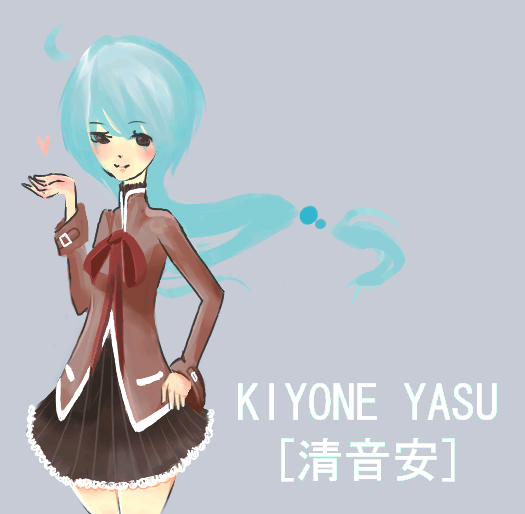 And if you wanted to know more about her personality and such..
Kiyone's a big tsuntsun like I said before. She's got a short temper so obviously,she's irritable too. If you prod or tease her,she'll have a fit and overreact. Kiyone is usually drinking lychee flavoured bubble tea most of the time. Unfortunately,she won't hesitate to spit some tapioca balls in your face. She's a much bigger deredere when you manage to soften her up - which isn't that hard to accomplish really. She has some yandere as well if you stir her up enough. ..Basically,she's a World Is Mine Miku - but instead of wanting pudding,she wants bubble tea ..and to spit at you. Lol, I saw this, and I saw that nobody had posted, and I knew I had struck gold. It appears I was right. :c but still bro gonn'z stalk.